Some 20 years ago, I enjoyed a book titled, “Winning Through Intimidation,” by Robert J. Ringer. Ringer was a realtor who faced many tough experiences in his quest for success. He was never told about closings from which he should have received a commission; he would receive a pittance of the commission he thought he would receive; and he was always treated with little respect when he tried to carve out a place for himself at the table of life. If I didn’t know better, I might have thought Ringer was a chiropractor. Ringer did the unthinkable: He enhanced and improved his posture. He developed a business card the size of a birthday card. On the front was a picture of the Earth. Each card cost $5, and that was back in the 1970s, but he figured it was worth it, as this started the process of people treating him with more respect. 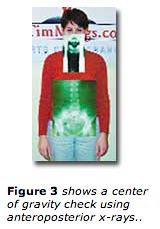 He then decided that ultimate posture could be attained if he, too, had a lawyer representing him at closings. It was his position that an unwritten “lawyer-to-lawyer code” said they would never, under any circumstances, disrespect each other in any business matter. So, at each and every meeting and closing, Ringer would show up with a lawyer. Finally, when money started coming in the way it was supposed to, Ringer purchased a private jet to travel to and from projects from afar, never missing even the smallest meeting. He would transport buyers and sellers, and represent himself as the key person in all of his transactions. In essence, he wanted everyone to see him as indispensable and absolutely necessary for any sale to take place. Once he achieved this, commissions became an afterthought. Needless to say, the state of chiropractic can be directly measured by the 6%–8% of the US population that uses chiropractic. Simply put, this is just unacceptable. However, if chiropractic is to ever grow from this point, we need to be brutally honest as to why we have not grown during the past decades. Yes, we can all agree we have much going against us. In this country, we live in a medical-model system. Whoever can provide the best and quickest pain relief is going to make the most money. Even though this is the lowest standard of care any human can ask for, this is the way it is. Patient expectations, poor insurance reimbursements, and medical marketing and advertising make it very difficult to change the way the system works. We all graduated with the hope we would help correct the cause of problems, but once in practice, we soon realized that if we enjoy the art of eating, we had better defer to the system that exists out there. And, slowly, we became people we didn’t like, respect, or understand. We’re reduced to marketing our adjustment as a better and quicker way to relieve pain. Oh, my. So, when we talk posture, it becomes extremely difficult to walk tall, act authoritatively, and pretend that we are the “experts” when it’s hard to even get paid for what we do. But, posture is the key to it all, and somehow, the profession needs to redesign its postural profile to reach newer and higher levels. How and where does that start? 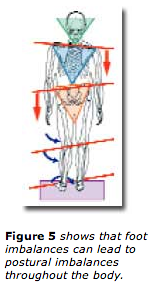 The first step in improving our posture is to clearly define who we are and what we do. With a clearer definition, it becomes easier to recognize who our market is and the value we bring to this market. We can’t hope that our community will fully understand who we are and what our product is all about using only the previous knowledge they’ve learned. Much of that knowledge is incorrect or learned through inappropriate sources. We must rewrite the information our community is getting, and it all begins with us defining more clearly who we are and what we do. Once our value is better recognized, then we just need to get the message out there. With the improved response we get from members in our community, we will feed our inner selves, making our belief system grow even stronger. In chiropractic, we have created many subspecialties. This subspecialty idea will help dictate who our market should be and what our job description is. We need to simplify the definition of who we are and what we do. If we can’t tell it in three lines or less and make an impact, then we will never get the public to understand. The people in our market are going 100 miles an hour in life and are constantly bombarded with advertising and marketing stimuli from all directions. We need to be clear and simple. help people manage that improvement for the rest of their lives. With this simple explanation, most people are intrigued, as no one has ever suggested to them that they can delay degeneration. No one has ever suggested that a “plan” can be created just for them. Most people are interested because this message is not based on symptoms, crisis/pain management, or surgery. It is based on universal information—imbalances increase the likelihood of injury and accelerate the degenerative process. A statement like this will move people to consider your care. Next, we need to raise the level of responsibility to the patient. Much of health care today is increasing liability protection at the expense of good will or helping the patient. And the public feels this separation every day. A profession with the courage to increase the responsibility—similar to the doctors of yesterday—will inevitably be viewed with much greater respect. We need to do the proper testing, make the proper recommendations, and be willing to painstakingly manage the patient to a higher level of health. The current system is a superficial, test-oriented, symptom-relief system, and this will help no society have a better future. This superficial help also will minimize the quality and depth of a relationship between a doctor and his patient. We must be aware of the pain, and care about the pain, but look beyond the pain. In my office, we want people to come in when they are asymptomatic, as full physical testing can be done then. If the patient is in pain, we need to rule out pathology and start him on a pain-relief program. We never know how long that will take, but the patient understands that, when the pain is improved, we will determine what corrective program is necessary. 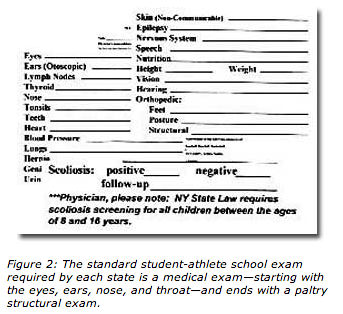 To rule out pathology, determine biomechanical faults, and show patients what their problems are, standing x-rays are mandatory. This information cannot be determined without them. If a correct explanation is given to the patient, rare is the patient who will not go through this testing. 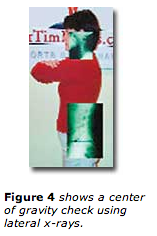 To let a patient talk a doctor out of taking x-rays adds to our weak posture. Full structural testing should complement the x-rays. 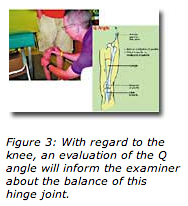 These tests include foot type, Q angle, joint range of motion, leg lengths, muscle strength and compliance, nerve testing, and any other tests a doctor feels is necessary. But the bottom line is, any treatment given without doing the preliminary testing will only add to our weakness. Most people in this country have never gone through a complete biomechanical exam; therefore, they live in a state of deferred maintenance. Chiropractors have slipped into the category of making a subluxation a pathology, and our goal, unfortunately, is to remove this pathology. However, it doesn’t take much intelligence to know that a subluxation at T12–L1 is always directly influenced by any abnormality in the arches of the feet. If we do not correct the imbalance in the feet, this architectural structure will never have a corrected T12–L1 motor unit. Therefore, custom-made orthotics are mandatory for long-term wellness of this patient. What I’ve come to learn is that just about every patient who comes to my office has multiple foot, knee, hip, low-back, midback or upper-back imbalances that will be directly improved with the addition of custom orthotics to their “plan”—especially over the patient’s lifetime. In fact, 95% of all patients in my office are fitted with custom-made orthotics at the beginning of their plan. Also, time is a crucial component of biomechanical improvement. If an orthodontist needs 3 years to help improve the alignment of a 12-year-old’s teeth (despite the fact there are no movable joints, and the teeth are not weight-bearing), then how on earth can we hope to improve overall balance, joint mobility, and muscle flexibility on 12 visits per year? The answer is, we can’t. So our posture in the community goes way up when we begin recommending something that makes sense. A conditioning program that includes spinal adjustments, extremity adjustments, rehabilitative exercises, custom-made orthotics, weight management, nutritional supplements, and whatever else is needed will always make patients feel as though they are going to “the best.” Six months is the minimum time frame any of us should ever recommend to a patient for corrective care. I know that conditioning is the only way to prepare for a marathon. The thought that someone will get their back to function better—especially when we know the aging process is a detrimental contributing factor—without getting in better shape is absurd. 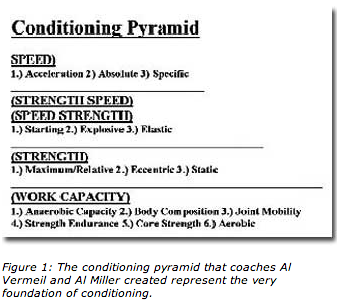 Time is mandatory for any level of improved conditioning. This skill requires confidence, communication, management skills, problem-solving skills, and true concern for the long-term wellness of the patient. Our profession would do well to provide these ongoing courses to all chiropractors, as this is what the public is looking for. Our posture will dramatically improve when we improve in these categories. When I tell patients something they don’t want to hear (such as telling them they’re not doing a good job at keeping their appointments), and that if they don’t improve they can’t expect the best results, this tells patients I’m not out to just be their friend; I’m out for their well-being. This is what patients want and need.